A very cute Facebook live video of Miss Earth models quickly took an extremely awkward turn. I mean, that is what tends to happen when you bring Hitler up to an Austrian right? Imelda Bautista Schweighart, who is competing for the Philippines in the Miss Earth 2016 pageant, caused outrage in the Philippines by comparing President Rodrigo Duterte with Hitler, the Daily Mail reports. Imelda hugs her Austrian opponent Kimberly Budinsky and then begins an incredibly awkward exchange by asking “Is Hitler from Austria?”. That’s a bad question because we normally don’t really talk about Hitler. But yes, he is. 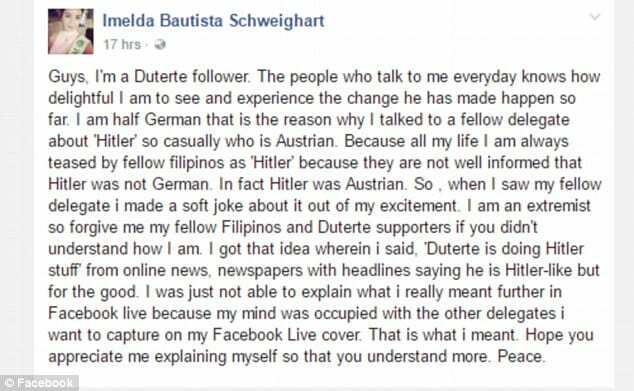 In an attempt to justify her awkward question, she likens President Duterte to the Nazi leader who orchestrated the murder of six million Jews in the Holocaust. Oh my God, our president is doing Hitler stuff here in the Philippines. People from the Philippines have shown their outrage on Miss Schweighart’s Facebook page. I hope you find forgiveness in your hearts because I didn’t mean it. I didn’t mean it in a bad way. Sorry. I just see headlines and I just said it. I didn’t mean it to be like this. I’m sorry. In late September, President Duterte himself likened his crusade against drug users and dealers to Hitler. I think people need to be more careful when throwing the Nazi dictator’s name around – obviously, no one wants anything like him ever ever again.